May 21, 2015 10:30 A.M.
Ontario is launching consultations to inform the design of new infrastructure programs and a framework to prioritize needs for communities and regions outside the Greater Toronto and Hamilton Area (GTHA). 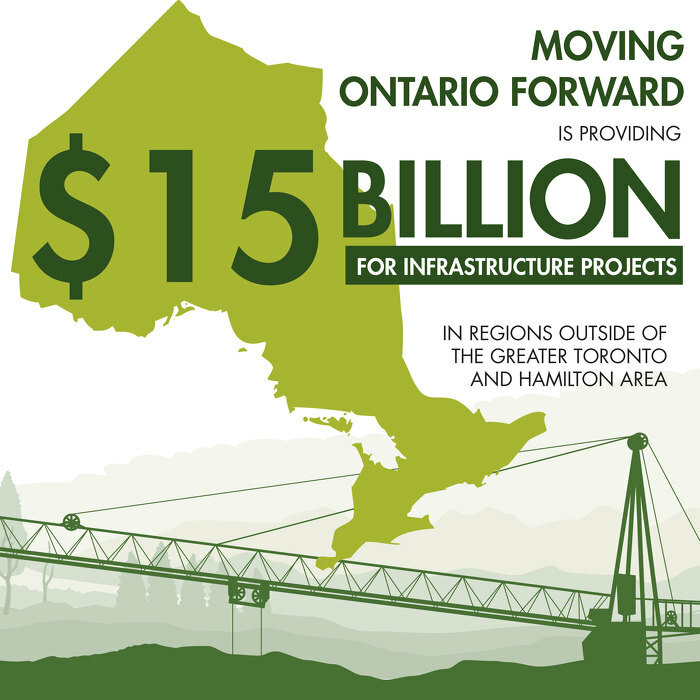 As part of Moving Ontario Forward, the government has allocated $15 billion for investment in roads, bridges, transit and other critical infrastructure in regions outside the GTHA. The province has released a discussion guide, Moving Ontario Forward - Outside the GTHA, to provide interested parties with information about these investments and how their voices can be heard. Feedback can be submitted online or in writing by September 18, 2015. Additional opportunities to provide advice will be available through regional roundtable meetings that will be held across the province in June and July, 2015. Supporting critical infrastructure across Ontario is part of the government's plan to build Ontario up. The four-part plan includes investing in people's talents and skills, making the largest investment in public infrastructure in Ontario's history, creating a dynamic, innovative environment where business thrives, and building a secure retirement savings plan. Moving Ontario Forward is part of the government’s plan to invest more than $130 billion over 10 years in public infrastructure, which will support more than 110,000 jobs on average each year in construction and related industries. A significant amount of that total investment, $31.5 billion, is allocated to Moving Ontario Forward, Ontario’s plan to improve public transit, transportation and other priority infrastructure projects across the province over the next 10 years. Part of the $15 billion in funding is already working to build important projects in communities across Ontario, including investments through the Ontario Community Infrastructure Fund, transportation in the Ring of Fire region, a new Connecting Links program and strategic highway improvements. This document was published on May 21, 2015 and is provided for archival and research purposes.